Mental health problems consist of a wide range of experiences/issues, some of which may be mild or moderate, while others may be more severe, affecting a person's ability to deal with day-to-day living. You may have heard about some very commonly discussed problems such as depression, eating disorders, self-harm, psychosis, stress and bipolar disorder. 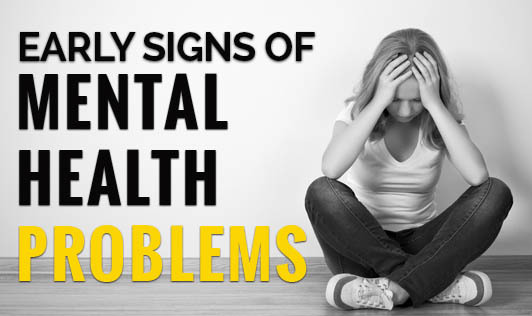 The early signs of mental health problems will differ from person to person and are not always easy to spot. However, at times, the signs become more noticeable to other people, for instance, if you're mood starts changing, it may take some time for you to become aware of it but other people may be much more conscious of the difference. • Wanting to go out more often, feeling highly energetic, creative and sociable, making new friends rapidly, trusting strangers excessively and needing very little sleep; this may signal that you are becoming "high"
The signs mentioned above can vary in severity. If they are distressing or continue for more than a short while, please seek help from a mental health professional!